The city council is seeking to accelerate plans to bring back publicly-operated buses – amid warnings the drivers’ strike is damaging efforts to get people out of their cars. A week-long walkout by First employees over changes to contracts enters its second day today, with even lengthier action proposed if no breakthrough is made. Councillor Ross Grant, the administration’s transport and regeneration spokesman, said the dispute was “greatly frustrating” and due to “very unfortunate” circumstances. And he revealed that he had written to the Scottish Government calling for restrictions on local authorities operating bus services to be lifted. “It is greatly frustrating for the citizens of Aberdeen and a very unfortunate set of circumstances that we’re finding ourselves in with the ongoing and escalating disputes with First Aberdeen,” he said. “We feel that a modal shift in encouraging people to use public transport is very important, and as part of that ideally we would like to see additional options on the table. Last year, councillors unanimously backed a motion to instruct council officers to investigate how they could bring back “corporation buses” to the Granite City. But it needs the Scottish Government to devolve powers to councils to establish municipal bus companies before a business case can be considered. A spokesman for Transport Scotland said: “We are committed to supporting services and tackling the historic decline in bus passenger numbers. 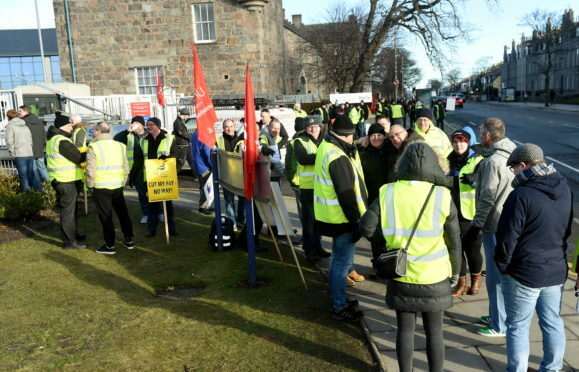 Yesterday north-east MSP Lewis Macdonald joined the picket line on King Street to support the bus drivers, who are protesting against proposed changes to their contracts which would result in longer shifts and reduced overtime rates.